Funko stock sold off with the broader market last month, but it's still up roughly 200% year to date. Shares of Funko (NASDAQ:FNKO) slumped 20.4% in October, according to data from S&P Global Market Intelligence . The pop-culture merchandise company has posted huge gains in 2018, roughly tripling year to date, so it's not surprising that the stock cooled off amid the biggest percentage-based monthly contraction for U.S. stocks since February 2009. Without positive company-specific news to buttress it, Funko stock saw selloffs that corresponded with the movement of the broader market. 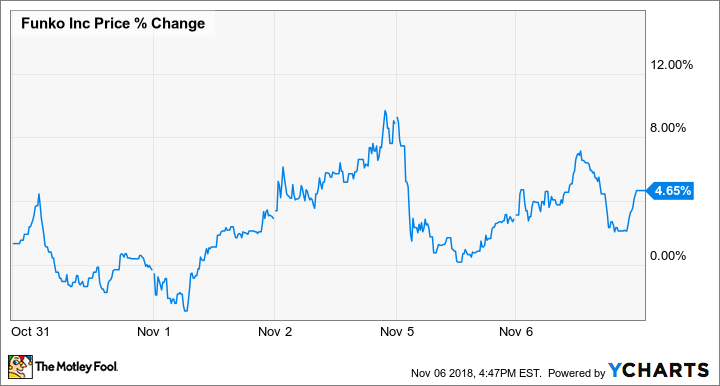 Shareholders shouldn't necessarily be spooked by October's double-digit decline, but the stock's market-crushing performance in 2018 presents a good reason to revisit the investment thesis. The company has benefited from, and helped drive, rapid growth for the pop-culture collectibles market, and its Funko Pop vinyl dolls have proved to be a huge sales hit. Funko partners with media companies to create licensed products that tie in to big entertainment releases. This model means the business isn't bound to the performance of only one or a handful of media properties, but investors should proceed with the understanding that there are still substantial risks. Roughly 82.5% of the company's revenue last quarter came from its figurines, with most of its collectible dolls made in the company's signature aesthetic style. Continued growth for entertainment merchandise seems to be a safe bet, but whether Funko's aesthetic has longevity or a life cycle more reminiscent of previous collectibles like Beanie Babies remains to be seen. 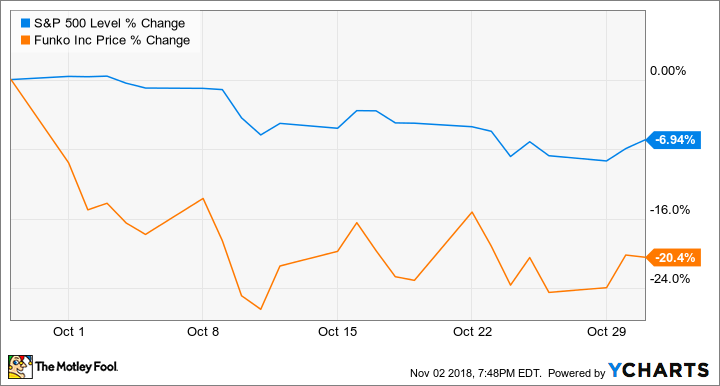 Funko stock has regained ground along with the broader market in November, trading up roughly 4.7% in the month so far. The company is scheduled to report third-quarter results after the market closes on Nov. 8. Management hasn't issued guidance for the period, but it expects full-year revenue to come in between $595 million and $615 million, representing 17% year-over-year growth at the midpoint, and adjusted EBITDA between $104 million and $112 million, up roughly 221% year over year.